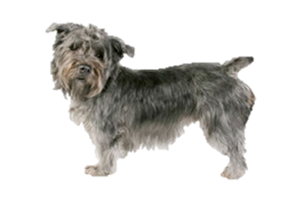 One of four Irish Terriers, the Glen of Imaal Terrier was originally bred to go to ground in the pursuit of badgers and fox. They also make excellent ratters, but today are most commonly kept as companions. The Glen of Imaal Terrier has been known in Ireland since the 17th century, specifically in the county of Wicklow. They are one of the oldest of the Irish terriers and has changed little over the centuries. It has been suggested that their origin began during the reign of Elizabeth the I, when French mercenaries were hired to put down civil unrest in Ireland. With them came their low slung hounds that mated with the local terrier stock to produce the breed’s ancestors. Irish lore states that before hunting vermin they were in fact used as “turnspit” dogs, kept to help cook meat by walking in large wheels that were used to propel spits. While there is little evidence to support the turnspit tales, the story has persisted enough that it can be found on the breeds profile with the American Kennel Club. By the 1950s the breed was close to extinction, but managed to be saved by a handful of devoted breeders. Today it is the rarest of the Irish terrier breeds, retaining one of the lowest level of registrations worldwide and is listed among the Vulnerable Native Breeds with the Kennel Club. Is the Glen of Imaal Terrier Right for You?